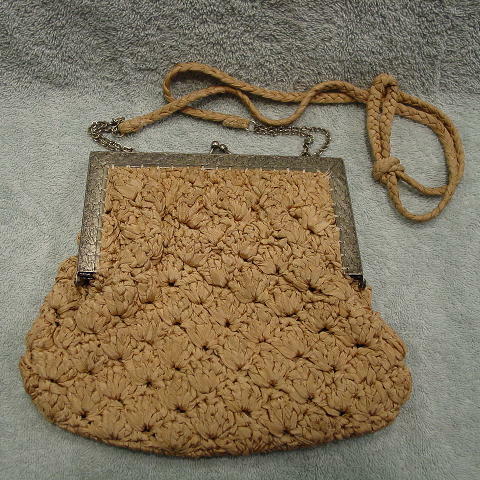 This handmade woven purse has a heavy silver-tone metal frame and bypass closure. The frame has an etched design of flowers and leaves. It appears to be made of a beige-bone grosgrain ribbonlike fabric which we think gives the appearance of a freeform flower design. 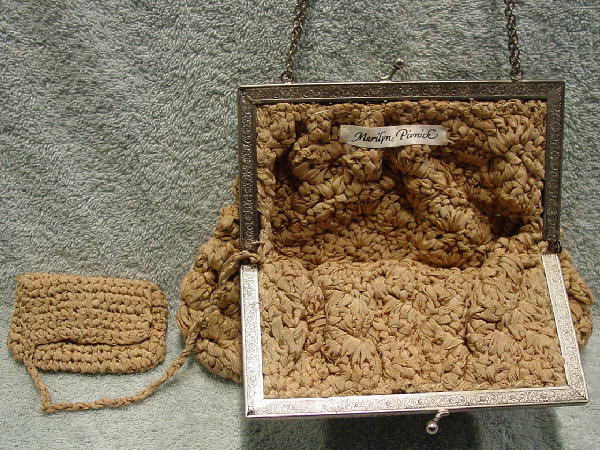 The tag inside says Marilyn Pivnick (we presume she is the lady who made it). It has a 41" long shoulder strap which is knotted with a 2 1/4" loop in the center. The 41 inches includes the 3 1/2" long double silver-tone chain link at the bottom of the 37" braided ribbon strap. The interior is not lined, but it has a 4" by 2 1/2" mini envelope styled change purse with a magnetic closure which is attached to the interior by an 11" braided ribbon strap. It has a vintage look to it.